Every preacher faces moments of challenge when people take him up on the message he gives. It is during such moments that you discover whether a preacher preaches out of conviction or out of book-knowledge. I remember having had one such opportunity. My discussion with a number of Christians and preachers revealed that it is a universal and often recurring challenge. It may not always be stated as pointedly as this but it is a basic problem of many unbelievers. Does God exist? 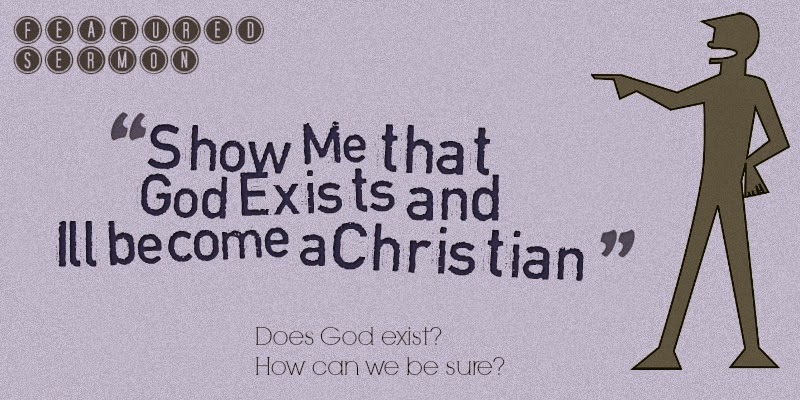 How can we be sure He exists? Whenever unbelievers and self-acclaimed atheists throw such challenges, they presuppose that you cannot show them any concrete evidence for the existence of God. There are a lot of people who believe that there are no objective evidences that God exists. Does God really exist? Are all who believe that He exists brainwashed by religion or are they deceived? Is there any evidence that we Christians can point out to unbelievers and atheists that show conclusively that God exists? My answer is yes, and a thousand times, yes! But what is the proof that God created all that is? The Bible says in Genesis 1: “In the beginning, God ...” God is the beginning of all things. He is the First Cause. Let us now discuss briefly the four basic arguments that exist about the origin of creation. First, for every effect there must be a cause. A car moving down the street, for example, does not just materialize out of thin air and start driving itself. Second, no effect can be greater (quantitatively or qualitatively) than its cause. That is, a cause must always be equal to, or greater than, the effect it causes. A large tree falling over, for example, must have a cause behind the fall which is quantitatively greater than a light breeze! A beautiful painting must be caused by something qualitatively greater than a few cans of paint falling on a canvas. Now behind every immediate cause there is obviously a chain of prior causes. Behind a printed page, for example, is an immediate printing press cause. But what caused the printing press, and what caused the cause of the printing press, etc? The logical conclusion of this casual argument is that behind everything there is either an infinite and eternal chain of greater and greater causes, or there is ultimately a first great cause which itself is infinite and eternally uncaused. Every rational person, including the unbelieving atheist, must logically conclude on the basis of this casual argument that at the beginning of the line there has to be an uncaused cause. The Christian believes reasonably that the God of the Bible is this infinite and eternal uncaused First Cause. Now applying the casual argument to what we find in nature, we then get the naturalistic arguments. The first in the series of naturalistic arguments is the Cosmological argument. The Universe – every star, planet and subatomic particle is an effect for which there must be a First Cause or Prime Maker. The motion of the universe is also an effect; the intricate motions from the orbiting electrons, to reverse spinning moons; to spiraling galaxies must be accounted for! The only adequate rational explanation for the matter and motion of the universe is found in the Bible. The Bible says: “What may be known of God is manifest in them, for God has shown it to them. For since the creation of the world His invisible attributes are clearly seen, being understood by the things that are made, even His eternal power and Godhead, so that they are without excuse.” (Romans 1:19-20). God’s eternal power is keeping the cosmos working and in order. So, when the Bible says in Romans 1:19-20: “What may be known of God is manifest in them, for God has shown it to them. For since the creation of the world His invisible attributes are clearly seen, being understood by the things that are made, even His eternal power and Godhead,(Divine nature or Deity, so that they are without excuse” It is declaring not only God’s power but also God’s nature as can be seen in what He has made. There is no doubt that the atheist who says that there is no God, believes that he himself exists. He, no doubt, looks around him and sees all things that exist around him. He, no doubt, sees the stars, the sun, the moon, the little beautiful flower, the rivers and the teeming millions of creatures inside the sea. He breathes in the air and feels the warmth of the weather. He watches as the day breaks and sees the setting of the sun as the dusk sets in. He sleeps and wakes. All these things are effects – they surely have an uncaused First Cause. God exists; He lives and is perfectly in control of the whole universe. He is the First Cause and is Uncaused. He is the Director of all effects and things. I am sure He exists and I am very familiar with Him. He is my Father and I spoke to Him a few moments ago. He lives and will live for evermore. Apologetic Debates - I enjoy watching debates on this issue. Here is one classic I would like to share: Frank Turek vs Christopher Hitchens. Labels: Apologetics, Atheism, Does God Exist?